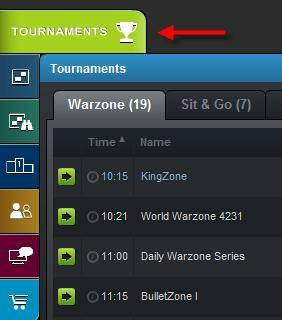 - Click on the Tournaments button to open the tournaments panel. - The Tournament panel displays the current and upcoming Tournaments and shows detailed information on each one. - Click on a Tournament in the list to open its lobby. - Once you've found a tournament, click on the big blue 'Enter Now' button in the top right to enter. - When the tournament starts games will open automatically for you to play. - You can also invite friends to the tournament with the "Invite Friends" button. - Follow your progress in the tournament by using the yellow tabs. View the standings by clicking on “Leaders”, or watch the Tournament games by clicking on “Games”. - Click on the play button to select what type of game you want to play. By default, you will see the seek list, however you switch to a graph view by clicking on the “Graph” tab. Edit your game preferences. When you're done click 'seek'. - You will see potential opponents who closely match your settings. Click on the opponent you want to challenge. - 'Quick Match' will automatically match you with an opponent, and start the game. - During the game you have the ability to offer a draw, resign, abort in the first two moves, take-back, flip the board or copy the moves to your clipboard. - After the game you can offer to have a rematch against your opponent. 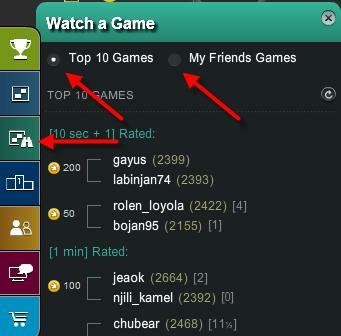 - You can easily watch a game by clicking on the Watch button. 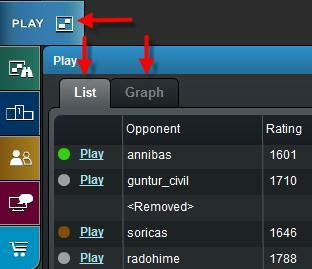 - You can also see a list of live games by clicking on the tab 'Live Games' when you are in chat rooms. - Select the leader board you would like to view. You can also display hourly, daily, weekly and monthly leader boards per type. 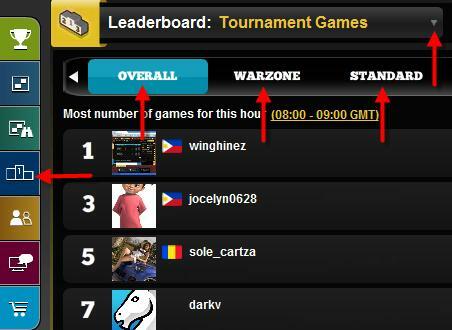 - You can also choose to have the leader board display the top results for your friends only. 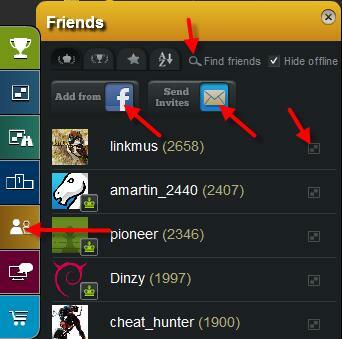 - You can quickly add friends by clicking on the Friends button, then ‘Find Friends’. - You can view how well you are doing against your friends by reordering your friends list. - You can order by ‘General Rating', 'Tournament Rating', 'XP Level' or alphabetically. - Click on the search icon to find friends. - You can search friends by their name, username or email address. - Come say “hi” to your fellow Cubers! 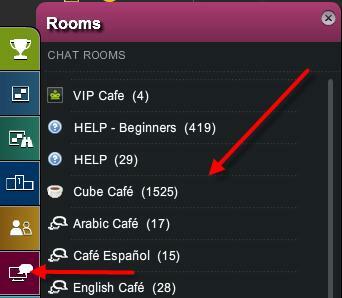 Click on the rooms icon to view a list of chat rooms. Join the room by clicking on it. - Click on the shopping cart icon, this will open the store. - Browse through the items available through the categories. - Click on the “Buy” button to purchase an item. The item you buy will be put in your inventory. - Click on your avatar (picture icon) in the top right to open view your profile menu. - Your profile menu contains your overview, inventory, stats and past games, and the log out button. - This is where you can track and use the items that you have bought in the store. - Here you can see a list of your past games. - Click on a game to view it. - Track your performance as you play. 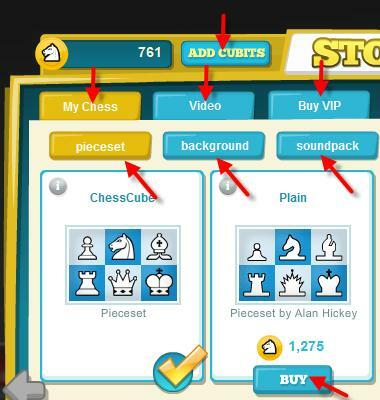 - ChessCube has 2 currencies that you can use to play games, tournaments and buy items in the store. - Complete the 6 tasks in the progress bar, and earn bonus Cubits! Once all tasks have been completed, the progress bar may be closed. - This shows what your current level is. The more games you play and tournaments that you compete in, the faster you’ll progress through the levels! - General rating shows your rating level from games that you play. - Playing in Tournaments affects your Tournament rating. - The message bar will keep up to date with all the news about your friends, top games, tournament information, and ChessCube offers and specials, and many more! - You may choose to close the message bar while playing a game or Tournament. To drop the message bar while playing, simply click the expand board button in the game. This setting will be remembered. 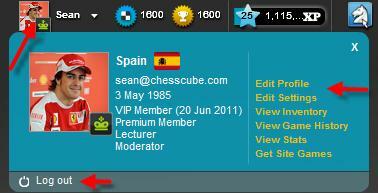 - ChessCube VIP members may permanently close the message bar.